The Traveler, otherwise known as "the Carpet Bagger" and Phineas, is my favorite set in the whole series. Why? Because of his accessories. They are the most ride-related and fan-oriented and it's here that I must pose my great question: who is behind these figures!? The goodly-size, detailed bases, the copious amounts of accessories (especially those that are pretty detailed or heavily ride oriented) and the tons of articulation really don't belong to such mediocre and sub-par figure. The sculpture style is amazingly shoddy and unrefined - it screams out, "here, these are directed at kids under the age of five and to no one else!" But what five, or less, year-old could appreciate the things I just mentioned? On to the review proper! Phineas is yet another mediocre sculpt that at least recalls the actual animatronic figure, very much unlike the Ezra/"Skeleton" figure. Accepting the lameness of the sculpt, the only real problem here is the color on the coat, which also rides too high on the figure to really allow for Phineas' hat to remain on his head. Articulated points number 14 (neck, balljointed shoulders, elbows, wrists, waist, balljointed hips, knees and ankles) and paint is simple but effective. 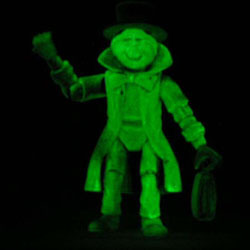 He's got a "smoky" glow-in-the-dark wash over a tan wash over a gray wash over light blue plastic. Accessories include Phineas' trademark hat and carpet bag/satchel, but the piece that really steals the show is the grandfather clock. It's complete with 13-hour clock face, demonic faces around the clock, cracked glass and pendulum that not only can swing back and forth, but also include the evil eyes on its head. This accessory is not only finely detailed, it is surprisingly accurate to the ride. As a fan of the ride, I absolutely love that they included this in the series. Its just one of those cool little touches that allows me to bring a little bit of the ride home. But surprise inclusions don't end there! The base is a simple stone floor with an angular stone block wall. Despite its simplicity, I really like the base because it can easily pass as the enclave where we first see the Hitchhikers before they appear in our Doombuggies, so, if one were so inclined, they could crowd all three Hitchhikers onto this one base to at least semi-effectively recreate that scene. But what's really cool are the show pieces included that can hang on the wall. 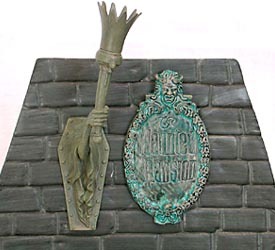 First is a replica of the super-cool, super-famous Haunted Mansion ride plaque that adorn the brick columns by the entry gate the to ride's queue. And again, what's so impressive is it's dead-on detail - the devil head, the vine-pattern, the font, the skull at the bottom ... this thing is a nigh-on perfect re-creation of the original! But wait, there's more! That's right, this set also includes the Jean Cocteau (or his film "Beauty and the Beast") inspired torch holder (designed by the brilliant Imagineer Rolly Crump). Yet again, nicely detailed and darn near ride-perfect! The proportions are a little off, but who cares? 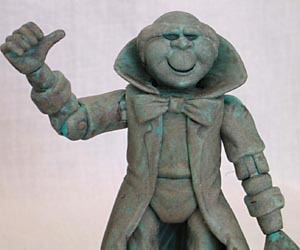 Who ever thought we would even see of one of these reproduced for sale, let alone in an action figure line!? So, between the torch-holder, the plaque and the grandfather clock, this set just completely knocks my socks off. If you are a Mansion fan, you need this set! Who's your favorite in the trio? Tell us on our message board, the Loafing Lounge.